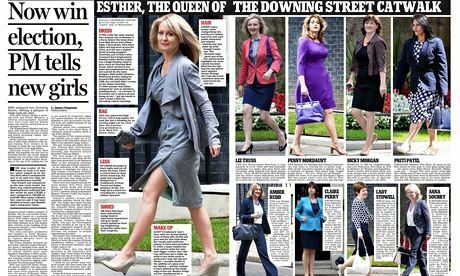 The Daily Mail dedicated much of its front page and a double-page spread to examining the hair, legs, bag, shoes, dress and makeup of nine cabinet ministers. The Daily Mail‘s coverage of the new women in the cabinet on the “Downing Street catwalk” has provoked outrage from female MPs and mockery from Nick Clegg, who tweeted a picture of himself posing in a suit. The newspaper referred to the employment minister Esther McVey as “thigh-flashing Esther” on its front page, before examining the hair, legs, bag, shoes, dress and makeup of nine ministers on a double-page spread. Jenny Willott, a government whip, said the coverage was “completely outrageous”, suggesting that intense scrutiny of their appearances may be a reason for there not being more women in politics. Caroline Lucas, the Green MP for Brighton Pavilion, accused the Mail of “sinking to an all-time low”, and the Labour MP Anne McGuire said it made the “Blair’s Babes headline look positively PC”. “These women are not on a ‘catwalk’. They are government ministers,” she said. The Conservative former cabinet minister Cheryl Gillan also said she was appalled at the treatment of her female colleagues. Following the furore, McVey, who was promoted to attend cabinet, brushed off complaints about the press coverage. The Wirral West MP said she was delighted that powerful women are being depicted on the front pages, after the newspaper described her as “Queen of the Downing Street catwalk”. As well as featuring a prominent picture, the Mail article described her appearance in detail, saying her dress “cinched in her waist and emphasised her bust”. An article accompanying the pictures described her as “sashaying” into Downing Street and throwing her “blond mane backwards as in a shampoo advert”. McVey told the BBC: “I’m delighted to be in what must be one of the most important jobs, that’s getting people into a job. The other key thing, well for me it is anyway, I wanted a voice from Merseyside, a voice from Wirral, at the top table making decisions there, so I’m delighted to have that, to really have a big say for the north-west … I’m going to use a north-west phrase – I’m chuffed at being at that cabinet table. The row came just days after the all-party parliamentary group on women made a series of recommendations about how to improve representation, including an inquiry into how female MPs are portrayed in the media. At the launch of the report, Caroline Spelman, a former Conservative cabinet minister, said she felt female MPs tended to attract “superficial criticism about what we wear or the timbre of our voice, rather than what we say”. Mary Macleod, an MP and former parliamentary aide to Maria Miller, said she wanted a focus on the “views, not shoes” of female ministers. David Cameron has been under pressure to appoint more female ministers after promising in opposition to make sure a third of them were female. After the reshuffle, five out of 17 full Conservative cabinet ministers – or 29% – are women. Of the overall ministerial team, only around a quarter are female.